You can help ease your child’s separation anxiety! It’s coming, the first day of the school year. Maybe this is your little’s first day of first grade, or second grade, or even the BIG first day of kindergarten. Either way, it’s the first day of another chapter in your lives. Change evokes nervous behavior (and possible separation anxiety) in anyone, including our children, and it’s our job as parents to be ready to help our kids through that process. The first day of a new school, or a sudden change to daily life, has the possibility to spark a phase of separation anxiety within young children. We’ve all seen it, especially as parents or as early educators, the heart-tugging drop-offs or the behavioral adaptations that take place as a result. But the GOOD news in that perceived chaos, is that it is in fact, a phase. Separation anxiety is a completely normal part of early development. In fact, many experts in the field of child development state that separation anxiety can come and go all the way until your kid is twelve years old. But once again, it is a completely NORMAL process for young minds to go through. So what exactly is separation anxiety? 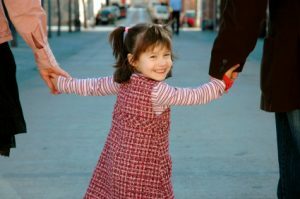 Technically, this form of anxiety happens when children are separated from attachment figures for long periods of time. This can include being away from parents, grandparents, and even siblings. Why does it happen? The short answer is: your child is learning how to cope with change. Usually, separation anxiety happens when a sudden life change occurs. While the first day of school definitely counts as a sudden change, so does an addition to the family, a loss of someone close, or moving, for example. • Crying and/or tantrums – This tends to be a staple in those hard drop offs. Children, especially young children, have a hard time expressing their frustration, fear, or sadness and thus a tantrum ensues. • “Clinginess” – You may notice your child has to be with you at ALL times, including when you go number two in the bathroom, and this is a possible sign of separation anxiety. This is different than wanting/needing one on one time with attachment figures, separation anxiety presents an EXTREME version of this. • Regressing – This includes a behavioral or physical “step backwards”. A developmental example of regressing would be potty training. Say your son was doing great with potty training, in fact he has been accident free for a month! But since then your family has moved states and now, he has a couple accidents a day. This would be a sign of normal regression. So how can we help our children with the coping process of change, and help minimize the possible separation anxiety? 1. Set the example- Once again, separation anxiety occurs as a means of coping with change. Children learn best by example and you have the ability to set a positive example on how to handle the change in a positive way. 2. Have conversations- Simply talking to your child and putting words to his feelings can help him express his anxiety in a healthy way. 3. Routine- If drop off seems to be a rough adjustment for your little one, try setting a routine to help him process what is coming and help grasp a sense of security. A great example is singing his favorite song beforehand. 4. Breathe- A lot easier said than done, right? But take some deep breaths and know that this is all a part of healthy development. Reach out for help if you need it and know that this too shall pass. Most importantly, enjoy the time. Elementary school is going to fly by, so cherish those walks to the school bus or the walk to the front door. Thanks for the read!